I don’t really like the Cardinals being a Royals fan. 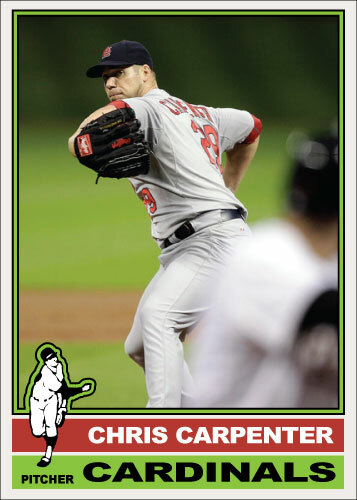 I would have to hate baseball to have not enjoyed the game Chris Carpenter pitched to knock the Phillies out of the playoffs though. It was an ALL-TIME great baseball performance. I actually wanted the Phillies to move on but when one performance is so good, like this one, it is hard not to be happy about it. I found this tasty picture of Carpenter and had to use it here. I really like pictures from this perspective a lot. It is just not an angle you see a ton for some reason. The 1976 Topps design is a very nice one and it makes this card look super sharp. The lime green was actually the color Topps used for the St. Louis Cardinals that year. I kept it the same to retain the “vintage” look. Really Topps? Lime Green? That is a great angle.